Introducing swimming to your young toddler helps them to prepare for proper swimming techniques and leads them to a healthy lifestyle when they grow up! Most importantly, swimming is an important life-saving skill that can benefit them and keep them safe for life. Once your child completed our swimming programme for babies, parents may wish to enrol their child in our toddler swimming lessons. This helps to keep your child active with a weekly swimming class, at the same time learn some advanced swimming strokes to further improves their swimming techniques. For our toddler swimming programme, we will gradually progress them according to their swimming performance and techniques, to keep them challenged and continue to improve. $300 for 12 lessons, excluding a one-time registration fee of $30. Give your baby the chance to become a water baby today. Sign up for our trial toddler swimming class! The aim is to learn how to teach your toddler how to sit and rock their body forward in order for them to be confident to fall forward and swim to parents without assistance. The aim is to strengthen the leg muscles, moving of their arms and enjoying splashing the water and grabbing toys and learning how to balance on the float. The aim is to teach your toddler to be able to float on the back without assistance. Kicking, launch forward swim, back float, balancing on float. The aim is to teach your toddler to be able to see and hold and grip on to the wall to survive. The aim is to teach to achieve horizontal body position and overcoming fear of swimming through obstacles. The aim is to teach your toddler to be able to swim and roll over on to their back to float and turn over again to swim towards you. The aim is to teach your toddler how to hold their breathe longer and be able to swim forward. 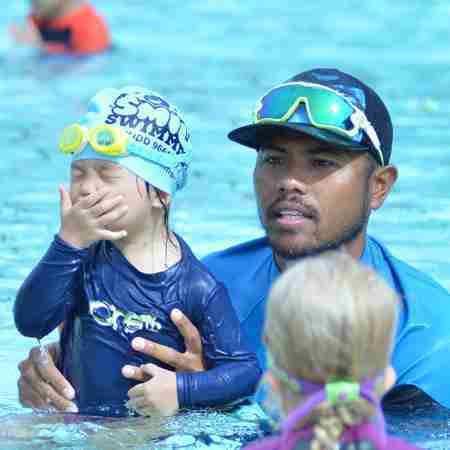 The aim is to teach toddler how to do doggy paddle technique, this is usually for the older toddler which is about 18 months old onwards and this usually starts in term 2 of the toddler course. Q: What age range is my child considered a Toddler? Q: What will they be learning? Will it be the same as the Infants Class? Q: If my child has not attended your Infant Course before, can my child still attend the Toddlers Class? A: Yes, Definitely! It’s never too late and better start now than later. Q: Do parents have to be in the water with the child? A: Yes. Parents will have to be in the water and assist your child as they are still not ready to be swimming independently by themselves. Q: Will my child get any certifications? A: Yes. They will receive Toddler Stage 1 for Term 1 and Stage 2 after Term 2. Q: My child is 29 months old, can my child still join this class? A: It would be better if you let your child try the preschool class. If your child is not comfortable or confident by themselves, you can accompany them in the pool for a few lessons and slowly let them learn to be independent. Unsure about our toddler swimming lessons? Speak to Coach Kidd to find out more about how our toddler swimming lessons can help your toddler.